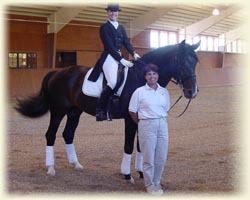 Donavan earned another USDF/Hanoverian Year End Award in 2002, 3rd Place at Intermediaire-II. He and JJ Tate continue to fine tune their already fabulous skills at FEI level Dressage. 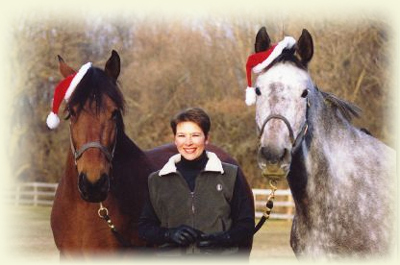 Thank you to Lori O'Brien for the holiday greetings and beautiful photos of Donielle, '96 mare by Donavan. Lori reports they are having a lot of fun together since Donielle has been under saddle. Donielle is the gray horse on the right. The Royal Winter Fair has just ended in Canada, one of the largest events of its kind in the world. We are pleased to report that Donavan's son, Donativo, was Jr. Colt and Gelding Champion, after winning his class of Colts and Geldings of 2001, He is owned by David and Maureen Lowrey. His sister, Dopple Dopple, owned by Kirsten Keene, won 4th place in the Fillies of 2002. DONAVAN and rider JJ Tate of Wyngate Dressage Center earned 3rd place in the country for Hanoverians at Hanoverian Society/ USDF All Breeds Awards Intermediaire II with a 61.436% median score (one score over 70%). Like good wine, Donavan improves with age! November 16th The MARES group welcomes JJ Tate and Donavan for a demonstration and talk about creating a Musical Freestyle. MARES stands for Madison Area Recreational Equestrian Sisters. There was a wonderful turnout at Green Meadows Farm and Donavan enjoyed their approval and attention! Polo anyone? August 11, 2002, the Big Guy and his Lady (JJ and Donavan) performed their Musical Ker in front of a crowd of about 600 gathered for a polo match between the Minneapolis and Milwaukee Polo Clubs. The match was held to raise funds for the Task Force on Family Violence and included a Fancy Hat auction, raffle, art exhibition, great food, and the exciting polo match. Every one was quite smitten with Donavan, and Olympic hopeful JJ Tate spoke with admirers and posed for pictures which Donavan truly enjoys immensely! Donavan (with rider JJ Tate) has qualified for the Region 4 Regionals at both I-2 AND GRAND PRIX and will compete for the Midwest Championships. We are not attending the Region 2 because JJ will be going to the World Equestrian Games. Sincere Condolances to Dee Butler, Va. on the loss of her '02 Donavan colt during the foaling process. We are pleased she will be breeding back to Donavan in the spring. She continues to enjoy her first Donavan filly, "Cookie"! Donavan and JJ Tate performed a Musical Kur before an appreciative audience at lunch time at the American Hanoverian Society Inspections at Oldenburg Farm, LLC, in Mequon, Wisconsin on July 23. We'll have pictures soon! A high quality group of new Hanoverians were presented along with Riverland Farms filly by Donavan out of Teerose. Drifter, by Donavan and out of Teerose, sold to Susan Link of Racine, Wisconsin. The 2 year old will be working with trainer Patty Becker. Congratulations and best wishes on the purchase of this promising Donavan performance gelding! Riverland Farm is pleased to announce the birth of Delicious, another beautiful filly by ES Donavan out of Thoroughbred mare Dots N Orbit (Kitty) on June 28. Delli is very feminine bay with two matching hind socks and a star, thin strip, and the Donavan snip! She is very graceful at only three days old! The plan for her is to event for the Costellos' daughter Jill. Delicious joins her half-sister Devotee, out of Teerose, in the same pasture. Devotee was born on June 13 and is a striking, elegant, long-legged bay filly, with star and snip. She has that friendly personality and beautiful movement from Donavan. She is half-sister to Winteroza by Winterprinz, and may turn gray also. Click here for more. We feel very fortunate that Devotee has a good nurse mare to care for her, after the sad loss of her mom, our beloved Teerose, following unexpected complications after Devotee's birth. Teerose will live in our hearts and memories through these wonderful foals! 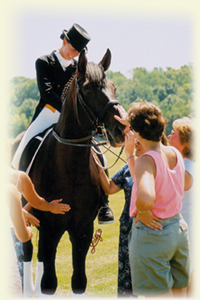 Riverland Farm sends sincere condolences to Jackie Ege on the loss of her beloved Deja (by Donavan), much, much too soon! We know they made each other very happy. Riverland Farm's Winteroza was champion of mares and fillies! Winteroza, a 2001 filly by Winterprinz, won her class of yearling fillies at the WDCTA Dressage and Breed show June 22 & 23. She went on to win the Mares and Fillies Championship for the show and the High Point Hanoverian. She is now qualified to attend the USDFBC finals! Visit Winteroza's page for current photos. Riverland Farm's Calico Mountain Sugar and Spice (Sugar), our beloved buckskin mustang mare, and her colt, "Spirit" (Esprit d'Amerique du Nordthe Spirit of North America), has just returned from Wisconsin Equine Clinic, greeted by the entire horse population! Everyone comments on how tall Spirit is compared to his mom, who is only 13.3 hands. They are thrilled with the two new grass paddocks with new fencing put up especially for this year's foals and mares. Click here for more. Duesenjaeger (Pilot) has returned home to the Riverland Farm after being backed. He is now almost 17 hh and vet says he is still growing a lot so the big boy will get some time off before he gets into hard work!! He just turned 3 on May 20th and is a "late bloomer!" Jessica Jo Tate, who rides daddy Donavan likes him a lot .. calls him "Little D."
Welcome Kay's First to the Riverland Farm broodmare band! 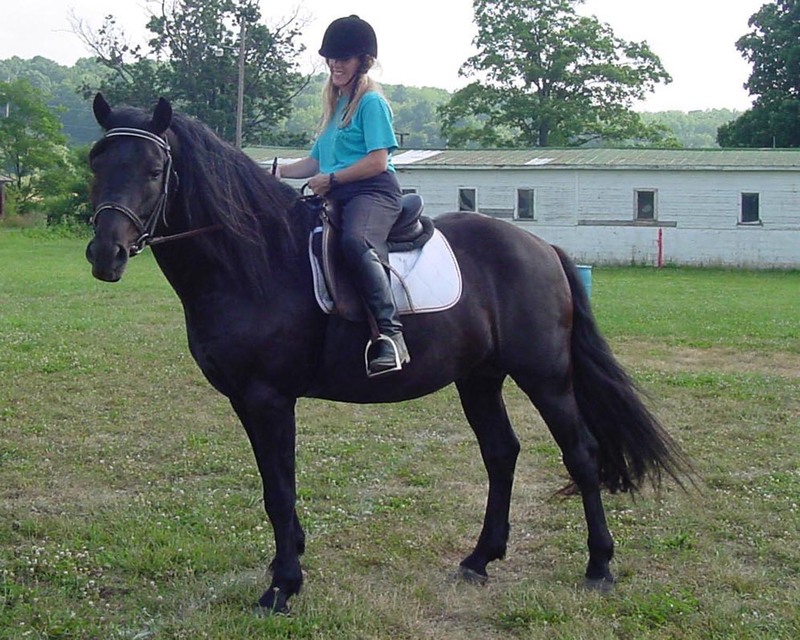 She is the dam of a 1999 colt by Donavan, Drachen Herz, owned by Margaret Goodell, and was bought because Drachen Herz is such a nice young stallion. Kay's First will be bred back to Donavan for a 2003 foal. Click here to learn more about the three-year-old stallion prospect Drachen Herz. Good News! Riverland Farm's "Remy," dam of Duesenjaeger (Pilot) is pregnant by Donavan again, and this should be a fabulous full sibling to Pi. 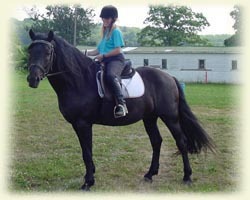 She is a Bold Ruler Thoroughbred approved by both the American Hanoverian Society and the ISR/Oldenburg Registry North America. Watch for our Blessed Broodmare page! Coming soon. Donavan is breeding to his all time high number of mares for the 2002 season as his fans grow in numbers! It can be a challenge for him to "dance around his show dates" to accommodate the increasing numbers of mares needing his services, but the entire "Donavan Group" of veterinarians, trainers, grooms, transport support etc. work closely together and make this possible with a smoothness and cooperation that is laudable in the industry. Donavan's owners, Wendy and Marty Costello, wish to thank JJ Tate, Candace Tate, and the entire staff of the Wyngate Dressage Center; Dr. Andrew Schmidt and Dr. Kristina Johnson and the staff of the Wisconsin Equine Clinic; Wayne Kiehnau and Gail Kelln of Liberty Equestrian Training Center; Anna Goebel of A.G. Enterprises; Karen Lietz of Karen Lietz Photograpy; and the Midwest Breeders Group for their help, support and talents and their true fondness for this special "Big Guy." With great enthusiasm and anticipation we look forward to 2002-2003. Thanks so much!! Riverland Farm's Calico Mountain Sugar and Spice (Sugar), our beloved buckskin mustang mare, had a colt on March 2 by J.P. Casselman Wilfred Dazzler, a Cheval Canadien (a Canadian). "Spirit" (Esprit d'Amerique du Nordthe Spirit of North America), is adorable, looks dark bay now, with a star and snip, straight long legs and beautiful face. He may turn buckskin like his mom. There were a few moments of concern, as he was born a bit earlier than expected, but is bouncing around mom and getting stronger. He is friendly and curious. 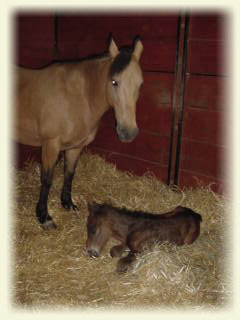 He and mom are at the Wisconsin Equine Clinic right now but hope to be home at Riverland with their friends soon. Dazzler w/ Rider. Click to enlarge image. Coming Soon: a foal by Donavan out of Teerose, Hanoverian Main Book mare, and a foal by Donavan out of Dots In Orbit, TB mare. Drachen Herz, and Duesenjaeger, the Dynamic Duo of 2001, both have been started under saddle and all reports are they were easy as pie to start! "Draco," the stud colt, is already being ridden by owner Margaret Goodell outside and around the farm and is anticipating his 100 Day Test! All agree the special sweetness and easy trainability come from their Dad, Donavan. Donavan and Jessica Jo Tate performed at Equine Affaire in Ohio and at Midwest Horse Fair in Wisconsin in April, and started their show season at Silverwood Farm in May.